Cabinet minister Hilary Benn is now just three nominations short of the minimum required to formally enter the Labour deputy leadership race. Mr Benn, a one-time bookies' favourite, is the only one of six hopefuls who has not yet reached the 45 backers needed by Thursday to get onto the ballot. Four other frontbench contenders and one backbencher have enough, with Alan Johnson leading the field on 70. 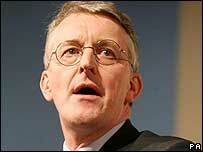 Mr Benn has 42, having gained eight nominations since Tuesday. Both Prime Minister Tony Blair and deputy leader John Prescott will stand down on 27 June. International Development Secretary Mr Benn had been seen as the frontrunner to land the deputy's job, attracting support from across Labour's political spectrum from former Cabinet colleague David Blunkett to veteran left-winger Dennis Skinner. A recent YouGov poll of more than 1,000 Labour Party members and trade unionists gave the international development secretary a 14-point lead. But he faces a battle to gain enough support from Labour colleagues in the Parliamentary Labour Party (PLP) by 1230 BST on Thursday, to be able to enter the race. Mr Benn said on Tuesday: "I am really pleased with the strong support I have received so far from across the PLP and the party. "This election will be the first opportunity Party members have had to select a new leadership team when Labour is in government. "I know that members want the chance to choose from among all the candidates who have put themselves forward for deputy leader, and I am very confident that I will be on the ballot." The deputy leadership hopefuls with more than 45 backers are: Education Secretary Alan Johnson; Justice Minister Harriet Harman; Northern Ireland Secretary Peter Hain; party chairman Hazel Blears and backbencher Jon Cruddas. Mr Cruddas's campaign manager Jon Trickett said it was a "fantastic achievement" for someone who was the only non-ministerial challenger. Mr Johnson launched his campaign on Tuesday, saying he could be the "unity" candidate. He said: "I think I'm the right person at this time for this leader to be the deputy. I believe I've got the skills. I believe I've got the experience. "I believe I've got the background to enhance and complement Gordon's enormous appeal to the electorate. I can be a force for unity." Mr Brown, the clear favourite to succeed Mr Blair, would not be drawn on his preferred candidate for the deputy leadership. He told the BBC earlier: "I am not going to support any candidate. It is up to them to prove to the rest of the party how they will do it," he said. There are 352 Labour MPs, meaning all six candidates could get through to the national ballot. The winner, decided by party members, trade unionists and MPs and European Parliament members, will be announced on 24 June.